Technology has really screwed up, hasn’t it? How we laugh, cynically, reading accounts from the early 20th century of how technology was going to free us all to give us more leisure time. Of course in many ways this has happened, particularly in the domestic sphere. But we’ve simply found new technologies to keep us tied down in different ways to work, or to outrage. And everything’s so sinister. A car isn’t a wonder of the modern age that’s throwing open doors: it’s a box that’s contributing to the death of the planet. Even your mattress might have a hidden agenda. New Times, New Pleasures is about a different time, and an artist who fervently embraced technology in every possible way. 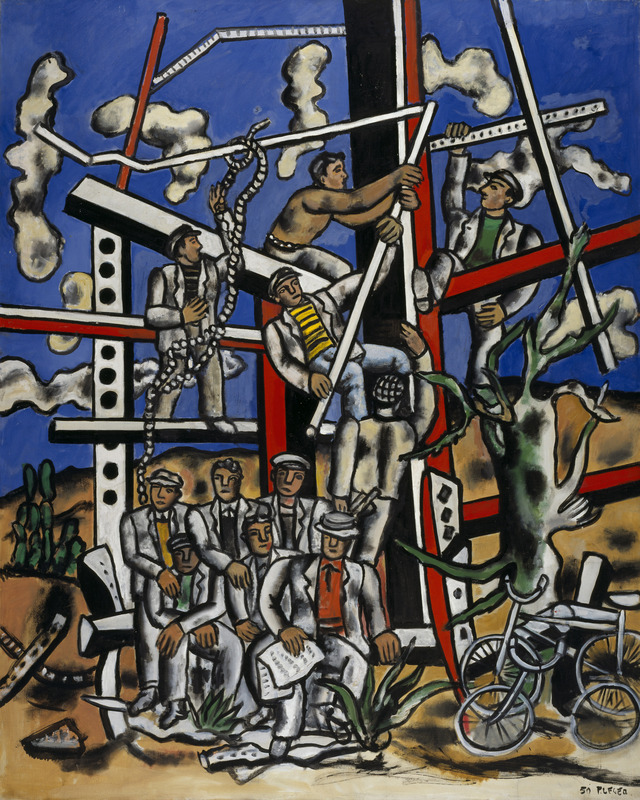 To Fernand Léger, it’s more than just a motif – although it’s that too, colourful and curious. His work embraces the new potentials for making art with new media. Léger’s optimism about the possibilities of new technology in a new century is still idealistically appealing. It might not have worked out this way. Right near the start of the show is 1917’s Soldiers Playing Cards, a work which reflects the mechanical nature of warfare, and its subsequent effects on humanity, brought in with WWI. It slightly reminds me of the Vorticists: a British group who were all excited for the machine age – until their war experiences replaced their optimism with horror. Léger seems to have found another way of looking at it. Having seen technology irreparably destroy the old world, he puts his faith in its ability to help create a new one. In the first room, Léger’s interest in technology makes itself apparent through shapes within paintings. Discs, tubes, and bars are within his mechanical language. You seem to sense his belief in the power of these elements becoming clearer, as his faith in how technology is reshaping the world grows. The inspiration of Cubism is more than a little obvious, but you also get a sense of the artist finding his own path. The line between the human and the machine becomes thinner. Homage to the Dance turns legs into propellers, or perhaps levers – certainly essential elements of a mechanical design. Then there’s the Mechanical Ballet, where people are mixed in to a series of relentlessly changing images. But the climax of these explorations is definitely the huge reconstruction of the mural Léger made in collaboration with photographer Charlotte Perriand for the 1937 Pavilion of Agriculture, 1937. It’s a joyous creation, populated by figures representing long-held traditions, brought into the modern realm through being captured in photography. Even from 80 years in the future, it feels optimistic and forward-facing. There’s other depths to Léger’s fascination with the possibilities of film, too. The “Poetic Objects” space is of paintings, but very obvious inspired by photographs. This may sound like straightforward still-life, but what he actually captures is more like a curated nature. They kind of reminded me of Instagram shots: the kind where you just know the outdoorsy “look-what-I stumbled-on” aesthetic has in fact been artfully arranged. Whilst respecting the subject, they also hint at the human hand organising the scene. So where does all this manipulation and revolution lead us? The final room of the show is intriguing. Its hinted (or in the handout, clearly stated) that politics has a big part to play in Léger’s outlook, but it’s not until here that the how of this becomes explicit. His technological optimism comes from his socialist belief in what it can do to improve the lives of ordinary people. This might be aesthetically, as evidenced by the selection of framed textiles along one wall. But it’s the paintings that speak the most. What unites the works is a sense that his subjects are having fun. Even though The Constructors: The Team at Rest are working hard, it’s made worth it by their togetherness. Leisure- Homage to Louis David is an explicit advert for revelling in the free time technology makes possible. If this all sounds like Léger’s work is all a bit propagandist, it is. The final paintings in particular made me think of Soviet artworks (my upcoming ‘specialist subject’) in their idealism. And yet Léger feels so entirely different to most of the works for the public being produced contemporaneously in the USSR. Their doctrine was about Realism, rejecting stylistic experimentation for ease of comprehension. 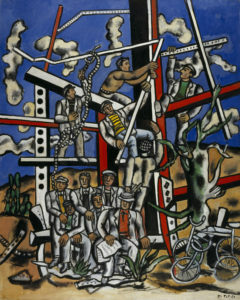 In contrast, Léger’s paintings work because of his artistic language. His technique of bringing figures into close contact, becoming a single unit – the most effective machine. The bold colours. I couldn’t call myself the biggest fan of the style of his figures, especially these later ones. 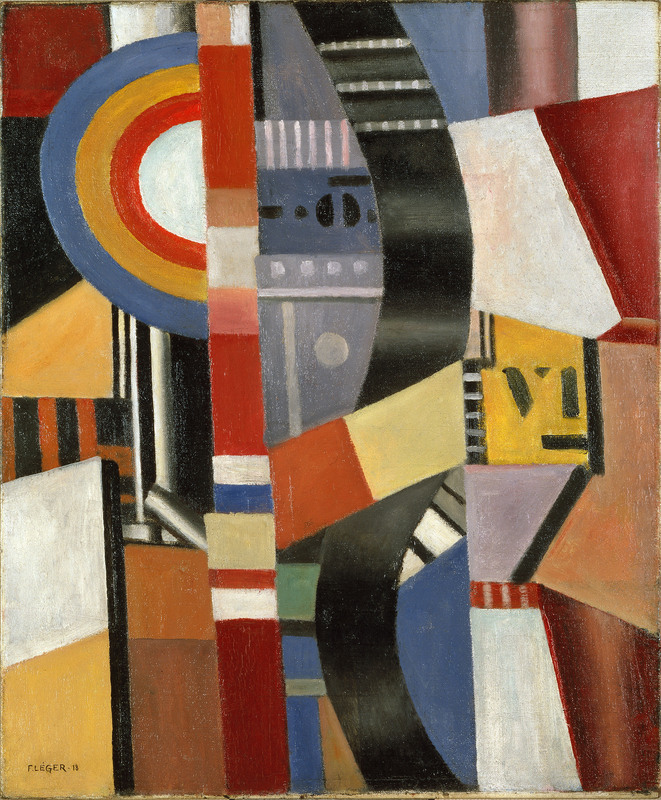 But I did leave wondering why, as an artist, Léger is probably most often regarded a side-note to the canonical voices of the 20th century. Is it that we lost faith in the potential for togetherness in the machine age? Or that life’s realities made these bright possibilities seem mere fantasies? It makes New Times, New Pleasures a curious show – knowing where the path went wrong, but wanting to buy into Léger’s vision and wishing it could have been different. This entry was posted in Current exhibitions, Exhibitions, Home and tagged art, artist, Liverpool, Tate. Bookmark the permalink.